What is it about us humans that we always seems to strive for progress, and envisage this as a linear trajectory towards a future that is better than the present? We want to ‘move on’, and ‘leave things behind’, as if everything worthwhile is just around the corner – if only we can get there fast enough. Why do we want “progress” ? Let me share some excerpts of my story “Serious About Innovation” where I let the protagonist reflect on the use and meaning of GDP, which, despite some debate, remains the dominant measure of progress. Such were their concerns that they joined the cry for “we need innovation, we need to become more innovative”. Indeed, innovation was something that 76% of Chief Executive Officers had declared to be one of their top 3 priorities, with one quarter even putting it at number one! Everyone seemed to share the view that innovation was the one and only way to compete and create a future, be it at the organisational or societal level, and to provide the growth that everyone considered to be so essential for the survival of humanity. Yet the wisest in the Council of Wise spoke up and asked, “Why is it that we talk about growth? And what is this growth that we are talking about? Are we talking about growth of individuals, of humanity, or are we talking about growth in consumption? It certainly seems to be the latter if we look at how we measure growth: we are looking at a country’s gross domestic product to decide whether they are growing or not. But do we want growth if it undermines the future for our children? Were not the Irokese Indians so much wiser when suggesting decisions be made with consideration of their consequences for 7 generations hence? In particular in the energy sector, would our decisions not be different? I believe we should look after the world for our children rather than feel that we have inherit (and own) it. Is it not time to find ways to measure what truly matters, instead of measuring that which can be easily done? I wrote the story a good four years ago, and feel that things have changed since, for the better. Not that we have come up with different ways of measuring progress in terms of wellbeing, but when it comes to the degree to which wellbeing and sustainability have become a matter of concern to business. For example, May this year MIT Sloan Management Review and The Boston Consulting Group published the results of an eight-year study into how corporations address sustainability and have come to the conclusion that “companies can develop workable — and profitable — sustainability strategies to reduce their impact on the global environment.” They offer up eight lessons that help companies do this – you can read all about it in their report, titled “Corporate sustainability at a crossroad – progress towards out common future in uncertain times” here. Other examples that mainstream is taking note of not only the need for, but also the advantages of, embedding sustainability are three McKinsey publications from the past few years. The first is a study that was conducted jointly with the Ellen McArthur Foundation in 2015 in which they conclude that “embracing the circular economy could boost Europe’s resource productivity by 3 percent by 2030, generating cost savings of €600 billion a year and €1.8 trillion more in other economic benefits”. The second is an article in the McKinsey Quarterly of November 2016, “Starting at the source: Sustainability in supply chains” by Anne-Titia Bové and Steven Swartz which explains why considering the entire supply chain is key to reaping the benefits. 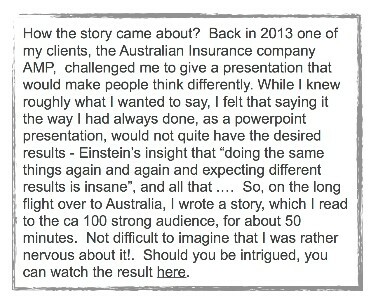 By the way, if the big consultancies start writing about things, it is probably time we all take notice! We should perhaps not be surprised though about this increased interest in embracing sustainability: more and more benefits of embracing it are emerging. Of particular interest to the ILF Wider Community should be the fact that sustainability is good for innovation – as Jujie Chen in his PhD titled Sustainability and company performance, evidence from the manufacturing industry (2015). Drawing on Global Reporting Initiative (GRI) reports, he conducted some empirical research to explore the relationship between environmental management practices and company performance. The findings indicated that many environmental management practices had a strong positive impact on innovation performance. Not only that, it also revealed that several social sustainability indicators, such as product responsibility, human rights, and society, displayed a significant and positive correlation with return on equity in the sample companies. It building customer loyalty – consumers’s awareness; Nearly two-thirds of consumers across six international markets believe they “have a responsibility to purchase products that are good for the environment and society” — 82% in emerging markets and 42% in developed markets. 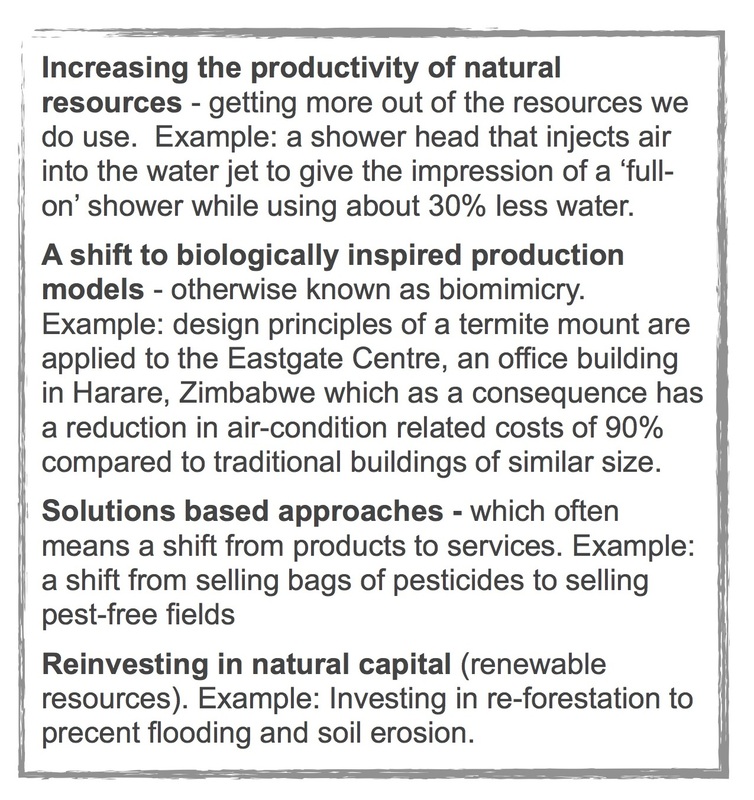 Some of the benefits identified above make me think of the four principles of natural capitalism – see text box on the right. I came across natural capitalism back in the early 2000s when one of the men behind it, Amory Lovins, happened to be at London Business School, and could be persuaded to join one of my networking group sessions. From the moment I was introduced to the four principles I felt that each one of them provided a fantastic springboard for innovation, from the incremental to the radical, from cost reduction to the creation of tope line growth! But what about financial markets, often used as an excuse not to move towards sustainability? It seems that there is increasing evidence that embracing sustainability, in the triple bottom line sense (ie considering people and plant in addition to profit) is paying dividends, literally. 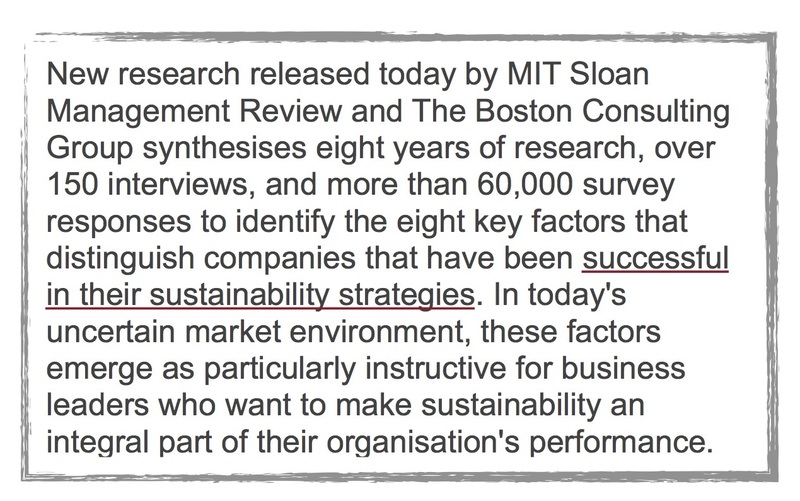 For example, back 23rd September 2014 the Guardian wrote, “Analysis of S&P 500 companies finds that corporations with sustainability strategies outperform others on the index“ and a study by Gómez-Bezares, Przychodzen & Przychodzen of FTSE 350 companies between 2006 and 2012 revealed that investment in companies that balance financial, social, and environmental activities not only outperform others in terms of earnings, they also experience less volatility and diminished shareholder losses during bear phases. These results were confirmed in a second round conducted for the years 2013–2015. That the trend towards favouring investment in socially and environmentally companies is only likely to increase is evidenced by investment preferences of millennials: according to a Forbes article from July this year: “This next generation of investors wants sophisticated platforms that are powerful and convenient — and make the world a better place.” It seems that those who believe a company’s only purpose is to make a profit are a dying breed.